“Her sound has passion, grit and electricity but also a disarming warmth and sweetness that can unveil the music’s hidden strains of lyricism ...” (New York Times). Isabelle Faust captivates her listeners through her insightful and faithful interpretations, based on a thorough knowledge of the historical context of the works as well as her attention to current scholarship. At an early age, Isabelle Faust won the prestigious Leopold Mozart and Paganini competitions and was soon invited to appear with the world's leading orchestras, including the Berlin Philharmonic, the Boston Symphony Orchestra, the NHK Symphony Orchestra Tokyo, the Freiburg Baroque Orchestra and the Chamber Orchestra of Europe. 2016 marks her first year as „Artistic Partner“ for the Mahler Chamber Orchestra. Isabelle Faust performs a wide-ranging repertoire, from J. S. Bach all the way through to contemporary composers such as Ligeti, Lachenmann and Widmann. 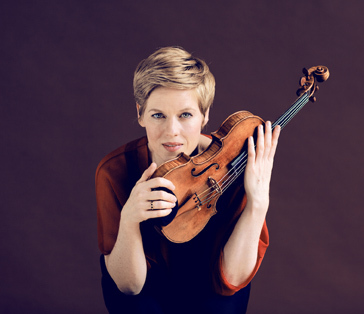 To highlight this versatility, in addition to her mastery of the great symphonic violin concertos, Isabelle Faust also performs works such as Kurtág's "Kafka Fragments" with the soprano Anna Prohaska, or Schubert’s Octet on historical instruments. She will premiere several new works for violin and orchestra during the next seasons, including concerti by the composers Ondrej Adamek, Marco Stroppa, Oscar Strasnoy and Beat Furrer. Over the course of her career, Isabelle Faust has regularly performed or recorded with world-renowned conductors including John Eliot Gardiner, Philippe Herreweghe, Daniel Harding, Bernard Haitink and Andris Nelsons. During recent years Isabelle Faust developed a close relationship with the late Claudio Abbado and performed and recorded under his baton. Their recording of Beethoven's and Berg's violin concertos with the Orchestra Mozart received a Diapason d'Or (France), Echo Klassik (Germany), Gramophone Award 2012 (UK) as well as a Record Academy Award (Japan).